Update 1/29/17: Added links in Editor-Publication table to editor websites and story lists. Most fans have a hard time making Hugo nominations for the Best Editor (Short Form) category. People tend to remember individual stories or publications, not the names of the editors involved. Even when they know the editor, they aren't sure if the editor is qualified, and it takes a bit of research to figure that out. Finally, even if you have a few names in mind, it's not easy to see how they compare with other editors. 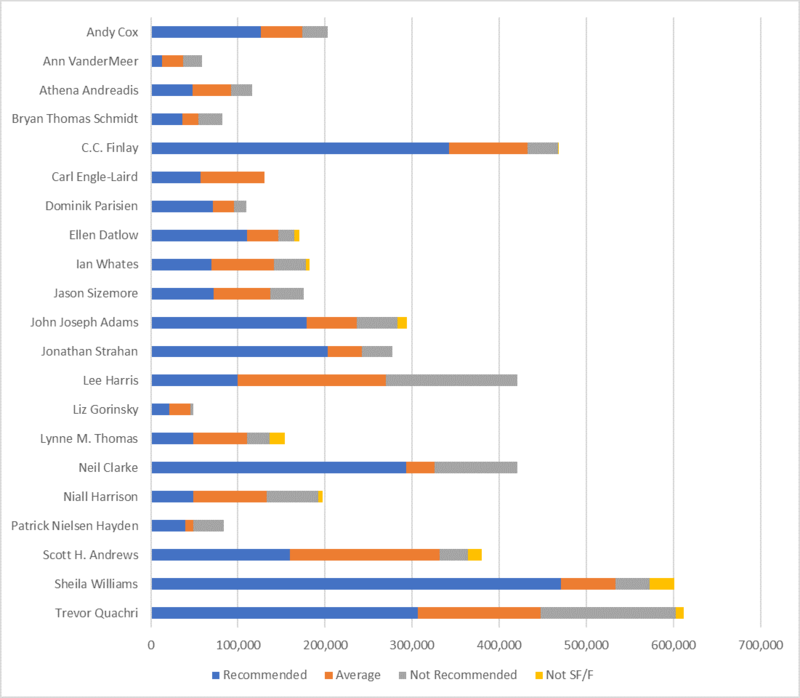 To make this easier for people nominating for the 2017 Hugo Awards, we've analyzed all the recommendations by six prolific reviewers of 813 original works of short fiction from the top publications of 2016, and we've distilled a list of editors, verified that they're qualified, and included charts making it easy to compare the work they did last year. This should make it a lot easier for people to nominate for the category with confidence. No one should nominate an editor if he/she hasn't read at least some of the work that person edited in 2016! The point of this document is to help people identify the editors of works they liked and help them confirm that they're qualified and worthy. There is no intent to create a slate of names for people to nominate blindly. The WSFS Constitution (section 3.3.9) requires a candidate be "The editor of at least four (4) anthologies, collections or magazine issues (or their equivalent in other media) primarily devoted to science fiction and / or fantasy, at least one of which was published in the previous calendar year." To determine eligibility, we used our own records, and we consulted the Internet Speculative Fiction Database and Goodreads. As we did last year, we estimated the equivalent of one magazine issue to be 45,000 words. Accordingly, we qualified an editor if he/she edited at least 45,000 words in 2016 and at least 180,000 words lifetime, even if those words didn't appear in anything approaching a volume or an issue. For the ten SFF magazines besides Tor.com which Rocket Stack Rank reviews, we've identified the eleven editors-in-chief (Uncanny has two) as the individuals who should receive the award. That makes sense because the editor-in-chief is the person who makes the decision on what gets printed and what does not. All eleven easily meet the qualifications. Tor.com isn't exactly a magazine, and it lists specific editors for its novellas and shorter fiction, so we've treated them as individuals. Out of seventeen editors whom Tor credited in 2016, only seven meet the qualifications. RSR read and reviewed original stories from eleven anthologies in 2016 which credited a total of twelve editors, but only seven were eligible for the 2016 Hugos. Of course there were more than 100 SFF anthologies published in 2016, and we do not cover content from ones that didn't attract our attention or the attention of other reviewers. Two individuals met the qualifications but RSR didn't review enough of their work to make any rational judgment. Mur Lafferty qualifies easily as editor of Mothership Zeta, but we only read two issues of it. Paula Guran qualifies as editor of at least 25 anthologies, including two in 2016, but we only read a single story in Tor.com that she edited. Accordingly we dropped both names. This table should be enough for you to identify which editors' work you've seen, except for Tor.com. To do a proper job for the Tor.com editors, start with the RSR Tor.com magazine page. Look down that list to spot any stories you especially liked and open their RSR Mini-reviews in separate tabs (CTRL-click on the RSR mini-review links). Those include the name of the editor. Based on your reading during the year, this may be enough to give you a list of just five people. However, just because they're qualified doesn't mean they're actually good enough to deserve an award. You should read at least a bit further to make sure. If you still have more than five people on your list, definitely keep reading to find criteria to trim your list. How much work (in words) did they publish? What percentage of their work was good? How much work did they publish by new writers? Not SF/F means stories that weren't science fiction or fantasy. It's important to keep in mind that "Recommended" is computed from the scores of many different reviewers, but "Not Recommended" and "Not SF/F" represents the opinion of Rocket Stack Rank alone. NOTE: In the charts below, "Lynn M. Thomas and Michael Damien Thomas" are abbreviated to just "Lynn M. Thomas" in the interest of space. Anyone nominating one should nominate both. One measure of a good editor is how much work he/she got published, that is, how many words of original fiction did he/she get into print. The following table shows how many words of original fiction each of the above editors produced in 2017, color-coded to show the quality. By sheer quantity, Trevor Quachri (Analog) and Sheila Williams (Asimov's) are ahead of everyone--the only editors to publish more than half a million words of original short fiction in 2016. When you excude bad stories and stories that weren't SFF in the first place, Sheila Williams (Asimov's), Trevor Quachri (Analog) and C.C. Finlay (F&SF) are the only ones over 400,000 words. When you only include recommended stories, Sheila Williams (Asimov's), C.C. 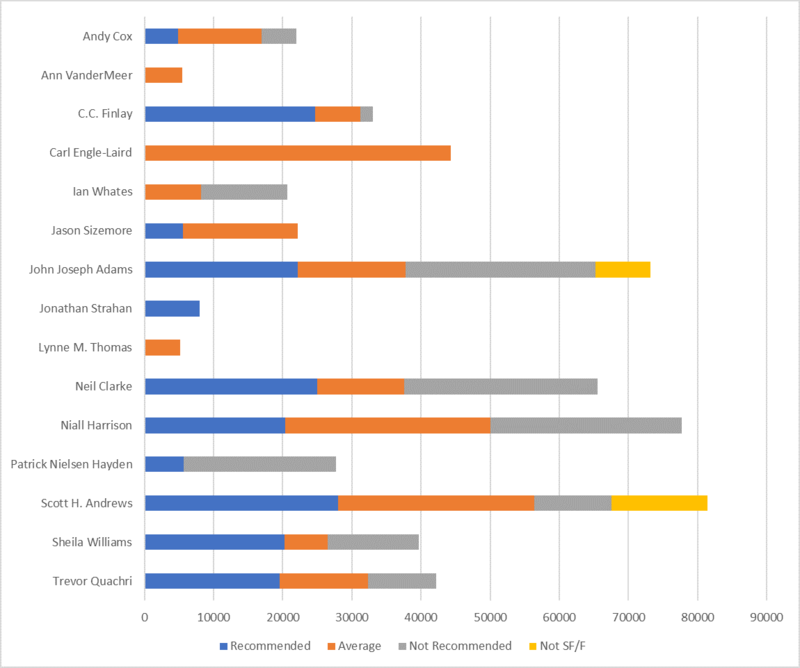 Finlay (F&SF), and Trevor Quachri (Analog) are the only ones over 300,000 words, although Neil Clarke (Clarkesworld) comes very close. If you think any of those measures is valuable, use them to decide which of the editors in your list should really be nominated for best short-form editor. A different way to evaluate an editor is to measure what fraction of his/her published works are any good. Or at least how much isn't bad. One of the biggest jobs of any editor is protecting readers from bad stories, after all. Carl Engle-Laird (Tor.com) distinguished himself by being the only editor in the list who produced no stories that RSR recommended against and none that weren't SFF at all. Liz Gorinsky (Tor.com) and C.C. Finlay (F&SF) both managed better than 90%. 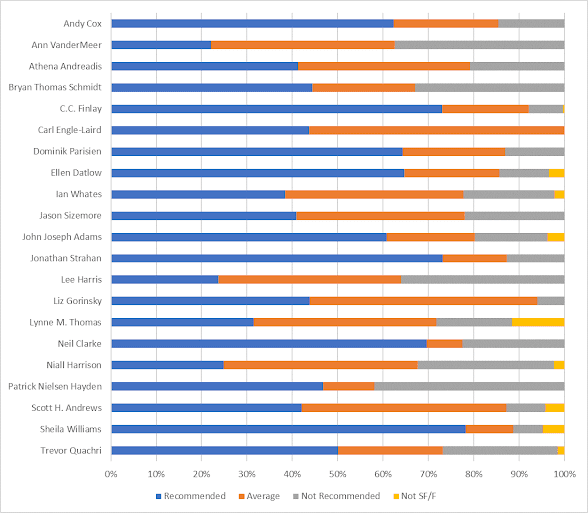 In terms of percentage of stories recommended, Sheila Williams (Asimov's), C.C. Finlay (F&SF), and Jonathan Strahan ("Bridging Infinity," "Drowned Worlds," and Tor.com) all exceeded 70%, and Neil Clarke (Clarkesworld) came close with 69.9%. As above, take a look at the editors on your list and see how they compare. A key function of editors is developing new talent. This last chart shows how many words of fiction each editor published that was by writers who were eligible for the John W. Campbell Award for Best New Writer, which means their first professional publication was either 2015 or 2016. Scott H. Andrews (Beneath Ceaseless Skies), Niall Harrison (Strange Horizons), and John Joseph Adams (Lightspeed) all published over 70,000 words of original fiction by new writers, and Neil Clarke (Clarkesworld) was close. When we exclude bad and non-genre stories, Scott H. Andrews (Beneath Ceaseless Skies), Niall Harrison (Strange Horizons) are the only ones at or above 50,000 words, followed by Carl Engle-Laird (Tor.com) above 40,000 words, and John Joseph Adams (Lightspeed), Neil Clarke (Clarkesworld), Trevor Quachri (Analog), and C.C. Finlay (F&SF) are above 30,000. It's probably unreasonable to expect first-time writers to get recommendations, and that measure doesn't appear to cast any light on the question of who the best editor might be. Likewise, we didn't do the percentage analysis for new authors because we didn't think it was illuminating. Note that six editors did not publish any fiction by new authors at all. All the above charts were generated from this table. If you click on the black arrows in the column headings, you can sort by those values. Or copy and paste into Excel if that's easier. 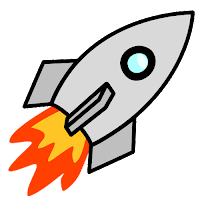 All Stories covers all the original short fiction first published in 2016 which was attributed to each editor and reviewed by Rocket Stack Rank. Campbell-Only covers the subset of all stories which were written by authors eligible for the John W. Campbell Award for Best New Writer. That is, authors whose first professional publication was in 2015 or 2016. Reco is the number of words "recommended" in the charts above. OK is the sum of words "recommended" and "average" in charts above. Total is the total number of words of original stories that editor edited. %Reco is Reco divided by Total. %OK is OK divided by Total. Pushing the Envelope: Did the editor publish anything special or daring this year? Reprints: Reviewers only recommend original fiction, but many readers probably enjoy the reprints just as much. Except for Interzone, everything we review is an SFWA-Qualifying market. That means that authors who publish stories there are eligible to apply for membership in the Science Fiction & Fantasy Writers of America. These publications pay more, and, hence, attract the better stories. We also rule out publications that do not focus on SFF, those which focus on horror and those that focus on stories under 2,000 words, although we do review such stories when they occur in other venues or when they turn up in "Year's Best" anthologies or major recommendation lists. That just leaves between three and five publications (depending on how you apply those rules) that we're missing, and we almost never see anyone else recommending anything from them. On the other hand, we added Interzone even though it's not SFWA-qualifying, simply because so many excellent stories are published there and keep getting recommendations. None of the omitted publications jumps out at us like that. Accordingly, we think the eleven magazines and eleven anthologies we read and reviewed this year were more than enough. A slightly different measure of an editor is how many bad stories they print. Bad stories range from things that never should have left the slushpile (1-star stories) to stories that make it hard for readers to suspend disbelief (2-star stories). These are stories that were recommended by any of the six reviewers we surveyed (see list). These include both RSR 4 and 5-star stories. As mentioned above, when RSR recommended against a story that anyone else recommended, we treated it as ordinary. Best Editor is a notoriously difficult category to nominate for, and while a number of people like our approach, it has also drawn some criticism. We're definitely interested in other ways to attack the problem, so please share your thoughts in the comments below.